In this article, we welcome our first guest writer. Tryggve Mathiesen, CTO at InformAsic writes about the challenges in the market and how Xilinx Zynq-7000 fits into the future of high-performance electronics. The programmable imperative is great, but the challenge in an FPGA for volume applications is to deliver the capacity at the power and cost of the ASIC and ASSP. we are focusing initially on a set of top and secondary markets. The top application within automotive systems is driver assistance. are just many of the attributes that this architecture addresses. Imaging includes smart surveillance and machine vision, industrial command/control and automation. for a variety of different networking standards, bridging, custom functions with real-time needs, etc. Enterprise femto, remote radio heads and baseband processing. These are looking for solutions to lower cost, system power and increase performance in an integrated solution. Aerospace and Defense where applications include targeting, guidance and navigation, surveillance, and secure communications. For Audio-Video broadcasting, prosumer, professional and studio cameras, routers and switchers. In consumer we anticipate a variety of higher-end consumer applications. This includes business-class multi-function printers, and we’re getting lots of good acceptance by these companies. In medical, imaging and various diagnostic, monitoring and therapy devices. In wired communications such as edge cards has shown good interest for this architecture. So, what markets and applications does the new architecture target? While you can and customers will find use for this new architecture in most markets and many applications, we are focusing initially on a set of top and secondary markets. A Microprocessor (µP) is just one component of many in a complex system of digital and analog I/O. Bus infrastructure ranges from logic efficient to maximum bandwidth. Single channel of communication, least amount of logic required and moderate routing requirement. Full duplex communication, moderate amount of logic required and minimal routing requirement. N-channels of communication, most expensive logic requirement and extensive routing required. What’s Needed is a New Class of Product! Conflicting Demands are Not Served. With a new architecture, Xilinx brings together the ASIC/ASSP world with programmable logic in some very unique ways. What do we mean by this? 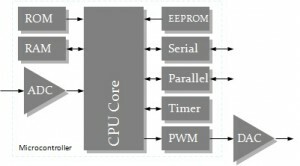 First, we start with the ARM CPUs we have chosen: the Cortex-A9MPCore. 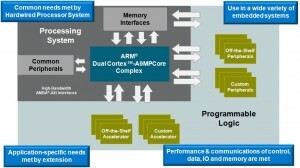 The ARM Cortex-A9MPCore is currently ARM’s highest performance application processor. 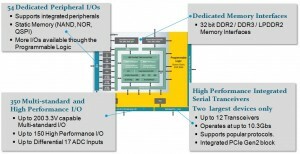 It is a 32-bit, multi-issue, superscalar processor rated at 2.5 DMIPs per megahertz per core. We can call it complex as it includes two of the cores in a dual-core implementation. It also includes dual NEON SIMD processors with multi-media and DSP instructions, and single and dual precision floating point processors. There are additional elements such as L1 and L2 caches, coherency support, etc. The key is that this is a fast, capable dual-core processor using the latest technology from the industry leader. Next, we have the high-bandwidth AMBA-AXI interfaces and interconnect. Based upon ARM released latest AMBA standard in March of 2010. What is important to know now on this is that this new architecture uses not only this within the hardwired SoC portion, but it also is how the customer extends the SoC with the programmable logic. We have multiple AXI interfaces between the hardwired SoC and the programmable logic to address control, data, I/O and memory. This is a key aspect as to what makes this architecture unique. Third, within the hardwired SoC there is a set of common peripherals that are used in a wide variety of embedded applications. These common peripherals include tri-mode Ethernet, USB 2.0, CAN, SDIO, I2C, SPI, UARTs, GPIOs, and other functions. Fourth, there are hardwired memory controllers for both FLASH and dynamic, or DDR-type memories. These portions make up what we call the Processor System. As has been mentioned, the Processor System is hardwired. In other words it is a fixed implementation built like an ASIC. The Processor System in the new architecture is lower power and lower-cost as well as higher performance than if implemented using a combination of hardened blocks and FPGA logic. By implementing a Processor System which is fully usable in a standalone manner, the architecture behaves as the customers expect and are familiar with. Software developers can start writing applications code and testing on real hardware immediately without a logic designer needed. The processor system is on its own power-plane and configures the programmable logic portion. The programmable logic is how the customer creates their own custom SoC or ASSP. Using the programmable logic the customer adds their own mixture of accelerators, peripherals, data-path processors, I/O interfacing needs, whatever their specific application requires. As it gets more expensive to develop devices on 28 nanometer, there are fewer and fewer ASSPs and ASICs on advanced technology nodes. However, the customer needs of more performance, lower power, lower cost and ability to differentiate are only increasing. The new architecture addresses this by enabling customers to develop their own custom device using advanced process technology without the cost and risks. ASIC Gate count can vary in range from depending on functions utilized Xilinx LUT6 can range from 2 ASIC gates (when used as inverter) to over 100 ASIC gate equivalents when used as distributed memory (LUTRAM). 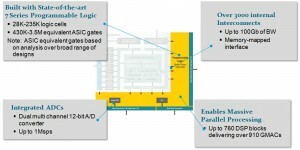 Most designs show average mapping of 10-20 ASIC gates equivalent per Logic Cell. Note: DSP Performance based on 600MHz DSP48 block operation with pre-adder for symmetric operation, 2 MACs per clock cycle. Widely Used ARM Development Environment so it is easy to migrate code already developed for ARM-based systems. 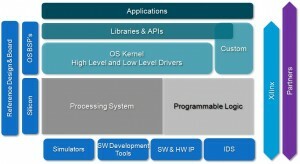 ARM Ecosystem Support, thus both ARM and Xilinx Software Development Kit (EDK) as well as other 3rd Parties exists today. Widely Available SW and Libraries, both Open source and Commercially available. A Backhaul Linecard with Zynq? And here we thank Tryggve for his insights. 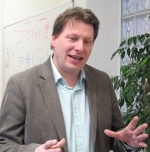 The interested reader can hear Tryggve speak at FPGA World 2011. He can also be reached through InformAsic, where he works as CTO. This entry was posted in Electronics, FPGA, Guest Writers, Platforms. Bookmark the permalink.